Scientists now estimate that more than 13 trillion gallons of floodwater from Hurricane Harvey flowed into the Gulf of Mexico following the storm. That massive plume of freshwater potentially threatens marine ecosystems in the Gulf and the salinity-sensitive coral reefs of the Flower Garden Banks National Marine Sanctuary, about 100 miles offshore of Galveston. A team of researchers recently returned from a 6-day expedition sailing out of Galveston Oct. 20-25 to collect data in the marine sanctuary’s reefs. The influence of Harvey runoff could still be seen along the coast right of Galveston, where salinity levels were low for this time of year, said Dr. Kathryn Shamberger, assistant professor in the Texas A&M University Department of Oceanography and Texas A&M Geochemical and Environmental Research Group (GERG) scientist, who was on the expedition. The team discovered that salinity levels in the Flower Garden Banks National Marine Sanctuary were normal; ongoing research is also needed. “We will now compare the water quality data we collected last week to data collected in 2016 to assess the health of the reef now,” Shamberger said. 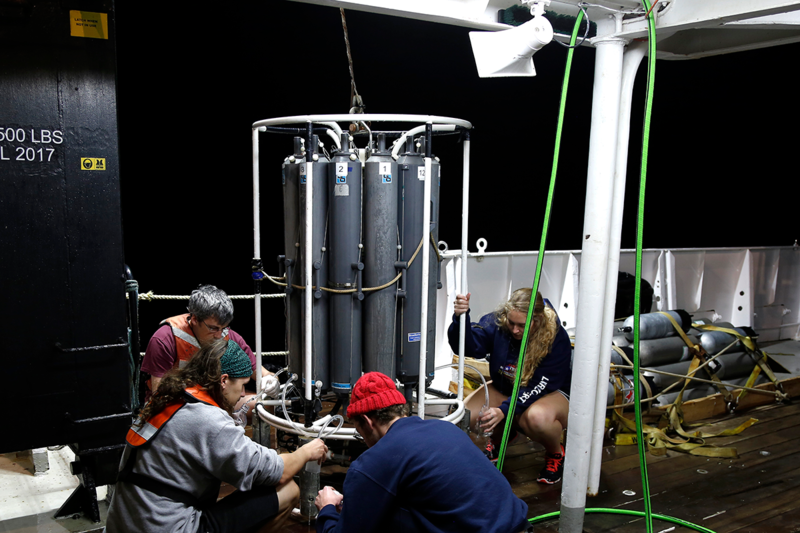 The research team sailed on the R/V Point Sur and included Texas A&M oceanography assistant professor Dr. Jason Sylvan, Rice University marine biologist Dr. Adrienne Correa, Boston University biologist Dr. Sarah Davies, and University of Houston-Clear Lake biologist Dr. Lory Santiago-Vazquez. The team expects to receive a one-year Rapid Research Response grant from the National Science Foundation (NSF) to support their work at the Flower Garden Banks. Researchers on the R/V Point Sur manage water sampling equipment. Photo courtesy of Dr. Jason Sylvan. 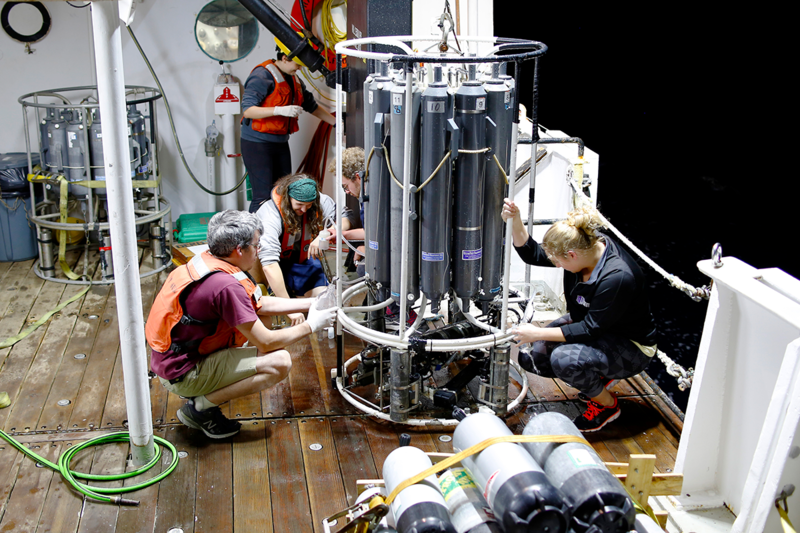 Two TAMU undergraduate students, Miranda Hooper and Brian Buckingham, were also on the cruise, as well as postdoctoral researcher Dr. Shawn Doyle. Gulf researchers had cause for concern after Hurricane Harvey because of salinity data collected by buoys in the Texas Automated Buoy System (TABS), run by Texas A&M GERG. TABS network buoys monitor the waters off the Texas coast and relays real-time ocean data. On Sept. 28, TABS buoy V measured a 10-percent drop in salinity in the Flower Garden Banks coral reefs. “The salinity at one buoy on the reef dropped from 36 to 32 on Sept. 28, but it rebounded to 36 by Oct. 4, and it has been between 35 and 36 since then,” Correa said. Shamberger and Sylvan are also working in collaboration with staff scientists from the National Oceanic and Atmospheric Administration’s Office of National Marine Sanctuaries to collect samples of water, microbes, sediment, corals and sponges to monitor the health of the reefs. “The Harvey freshwater had moved toward Corpus Christi and was northwest of the Flower Garden Banks when I was on the last cruise, which ended Oct. 1,” Shamberger said. This NSF grant and the team’s post-Harvey research at the reefs have roots in the April 2016 “Tax Day Floods” that also inundated parts of Houston. "Samples collected after the 2016 event revealed differential microbes in the water column near the reefs that experienced mortality compared to those who didn't," said Sylvan. He and his team are seeking to describe the water column microbial community in relation to Harvey to determine if this more recent freshwater runoff event had similar results to 2016’s. Flower Garden Banks, the only national marine sanctuary in the Gulf of Mexico, is one of 14 federally designated underwater areas protected by NOAA’s Office of National Marine Sanctuaries. Written in collaboration with Rice University.